Gundo Mmbi is a Wits BEd graduate and former Wits Education School Council transformation officer. She is a human rights activist and a proud member of the LGBTQIA+ community. She played an active role in the #FeesMustFall movement. 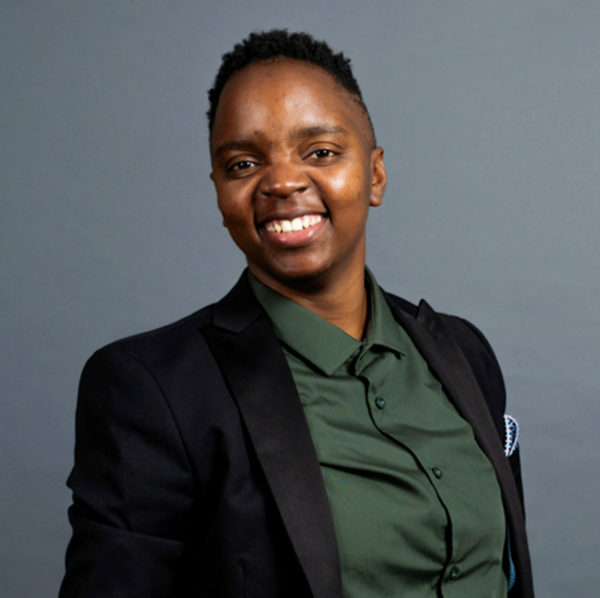 In 2017, she became an assistant principal at SPARK Turffontein and is currently the founding principal of SPARK Soweto. How did a young woman from Limpopo find herself at Wits? I was told that the child of a cashier will never make it to one of the country’s most distinguished universities. I wanted to break barriers by securing a bursary. I studied hard to achieve acceptance to Wits University and secured a bursary from the housing department to study. That’s how my Wits story began! You majored in mathematics and English. What factors motivated you to study BEd? Growing up, I have always been curious about who was setting my exam papers and why the quality of the questions was the way it was. The standard of mathematics in South Africa has been lowered for scholars. Each year, I have watched as the pass mark declines, gradually dropping from 50% to 30%. I don’t think it is the teachers or the scholars, but our country’s curriculum leaders and education officials who may lack faith in our abilities. Have you always been active in student politics and issues of social justice? Wits is a world on its own, and you learn a lot there about who you are and what type of person you would like to be. Student politics exposed me to a world of leadership and holding people accountable for what they Wits is a world on its own, and you learn a lot there about who you are and what type of person you would like to be. Student politics exposed me to a world of leadership and holding people accountable for what they are responsible for. I was a shy village girl when I got to Wits until I stood up against my English lecturer when he questioned my gender identity: the activist in me was born. How did your experiences at Wits lead you to where you are now? A degree from Wits University enables you to proudly embrace your diversity while being proud of your unique individualism. Wits taught me it is okay to come from Limpopo and be raised by a single mother while fighting for free education. At 27 you are the principal at SPARK Soweto. To what do you owe your success? I owe my success to the freedom that was fought for by the people of South Africa. Knowing that their fight for my freedom opened doors to higher learning, I was able to go after what I want with no restrictions or prejudice. I owe it to all the teachers that shaped my life, who ensured that I became the best version of myself and not forgetting “my mother and father” (the National Student Financial Aid Scheme) for the financial support when I needed it. What led to the move from Turffontein to Soweto? I applied to be a tutor at SPARK Maboneng in 2015 while completing my degree in education. I then became a maths teacher at SPARK Maboneng and taught for two years. An opportunity to grow into school leadership was offered, and I applied for it. I became an assistant principal at SPARK Turffontein and now founding principal of SPARK Soweto. SPARK Schools has 21 schools across South Africa, and I am part of a group of young people who are changing the face of education.